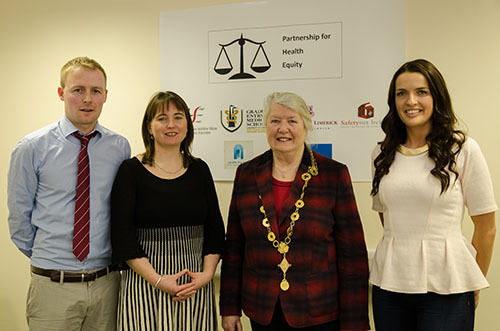 A new pilot primary healthcare service for marginalised groups has opened in Limerick as part of an innovative model of research in primary care. The aim of the project is to improve access to primary health care for groups such as the homeless, drug users, travellers, migrants and others who have difficulties in accessing and availing of primary care services. This project is being undertaken by the Partnership for Health Equity (PHE) which is a unique collaboration of clinicians, medical educators, social scientists and healthcare policy makers and planners. 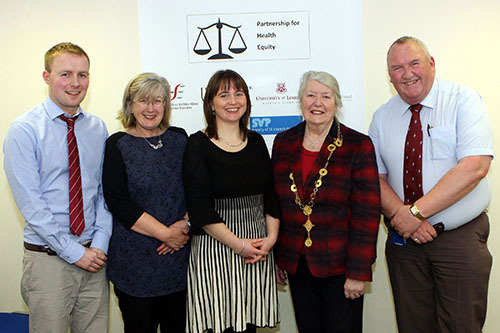 The PHE is co-funded by University of Limerick, North Dublin City G.P Training Programme and the HSE’s Social Inclusion & Primary Care Services. This two year pilot project has been developed in response to an identified need following a recent stakeholder mapping and consultation process undertaken by Dr Patrick O’Donnell of the PHE. The project is being supported by Safetynet which is a networking organisation for doctors, nurses and voluntary agencies that have been providing primary health care to homeless people and other marginalised groups in Dublin, Cork and Galway for some time. This initiative has been welcomed by John Hennessy, National Director, Primary Care, HSE and is seen as a positive step in improving access to primary health care for marginalised groups. 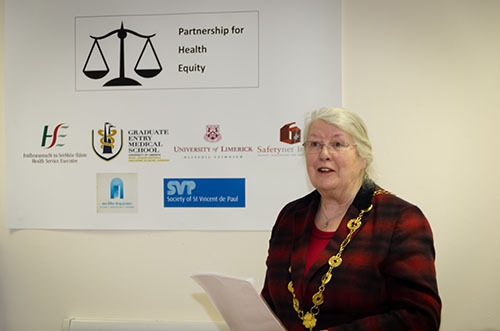 There is no other collaboration of this kind in an Irish setting and it is anticipated that the research and educational outputs of this project and the wider work of the Partnership for Health Equity will have regional, national and international application and relevance. Further research on access to primary care for marginalised groups in a primary care team / network setting in Limerick is planned over the course of the project. 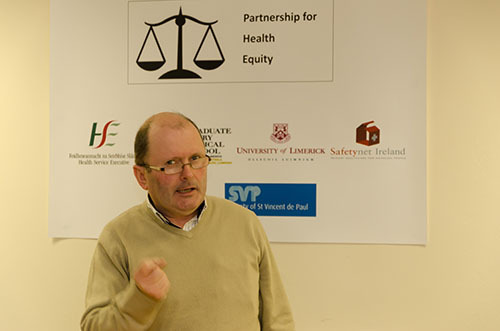 The appointment of Dr Patrick O’Donnell GP as a Clinical Fellow in Social Inclusion in Primary Care at UL Graduate Entry Medical School in October 2013 is a key element of the research model being undertaken by the Partnership for Health Equity. 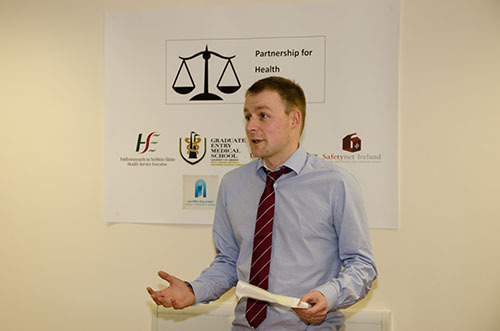 Dr O’Donnell has recently commenced a pilot GP low threshold service at two locations in Limerick City to gain an informed insight into policy and practice. These are located at the Ana Liffey Drug Project, The Fairgreen, Limerick and at the St Vincent DePaul, Drop-in Centre, Hartstonge Street, Limerick. 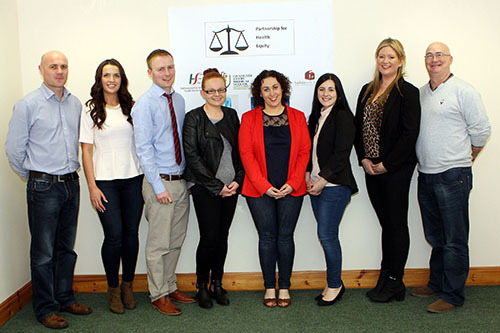 Both of these agencies have a history of advocacy and case working for vulnerable clients in the Limerick area. The work on this project is designed to complement the work of Ana Liffey / St Vincent de Paul and other stakeholders/ professionals involved in providing health and social care services. It is hoped the research conducted will ultimately lead to improved access and care for marginalised groups across the city. Action research is a type of research that seeks to identify problems, find and put in place practical solutions to those problems and then monitor and evaluate any improvements as a result of changes made.